I started late this morning with breakfast at a local dive diner in Savannah called Sunnyside Up. I love sitting at the bar watching an open kitchen during the breakfast rush. You want a meal and a show? Watch short order cooks pound out a breakfast every 30 seconds while you eat your $5 worth of eggs, bacon and grits. These guys ran their legs off. One guy on eggs, one guy on grits and hashbrowns and one on pancakes and toast, all of them filling in for each other if necessary, sliding the plates down the counter slapping one thing on after another and then “Order up!” the waitress grabs it and goes. Efficiency in action. It makes me happy. I had no plans today except to end up in Atlanta but, as I’ve noted before, point A to point B driving is boring so I took back roads to see if I’d find anything interesting. I’m listening to Fresh Air Fiend by Paul Theroux while I’m driving and I like it. He has a lot thought provoking things to say about being a traveler and a writer. Today I wrote down “good travelers aren’t hiding in travel, they’re seeking.” For me now, that’s true. I’m seeking to connect rather than to escape. But I’ve been a bad traveler too. I’ve used traveling as a way to escape reality. I think it’s an easy trap to fall into when you travel for a living. Touring companies create a bubble of their own reality. We know more about what’s going on in the lives of the people we work with than we do in the world around us. I can’t speak for everyone who tours, but in the past year I noticed that tour became one long blur of cities, each resembling the next. I ceased to adapt to a new city and instead tried to make every city adapt to me, my preferences and my schedule. My last touring city, Toronto, evaded me on every level and I had a rough 5 weeks where I was unwilling to bend and Toronto was unable to accommodate me. More than anything, this is why I’m taking a break from touring. I want to travel and see the world from my perspective and on my own schedule. So, I’m writing down these deep thoughts while driving down the back roads of Georgia (don’t try that at home) when I pass a tiny diner called the Whistle Stop Café. Anyone remember the movie Fried Green Tomatoes? I figured it was the café from the movie but I had just eaten and already passed it so I didn’t stop but thought that the timing was a bummer. Cut to 3 hours later. Now I’m hungry. 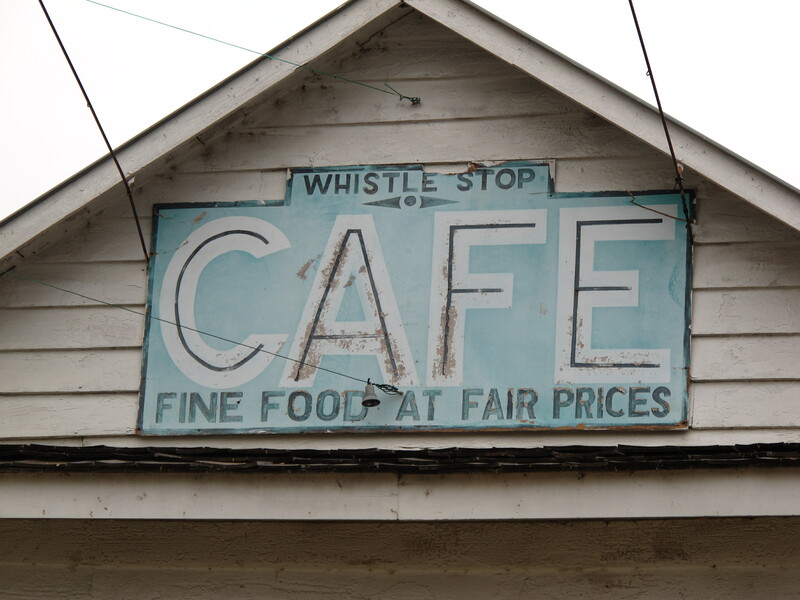 I literally thought to myself “I wish the Whistle Stop Café was up ahead because this would be the perfect time to stop.” Not 5 minutes later I see a big hand lettered sign that says Whistle Stop Café with an arrow pointing down a side road and I nearly cause an accident veering off the road to follow the sign. I had a moment of wondering what I was following but then I turned onto the prettiest little side road lined with charming buildings in Juliette, Georgia. I drove past a miniscule fire station, a wee little courthouse and 2 gift shops and then just pulled over and parked on the side of the road. It was the main street from the movie with the café at the end of the street and train tracks running right by it. 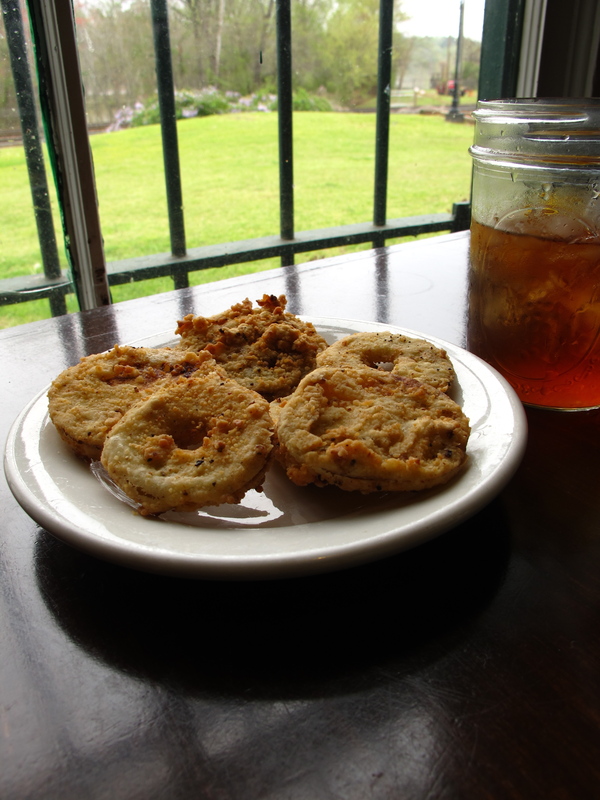 So I went in and had some fried green tomatoes. The owner told me that this street was the movie set from the movie. The café was already there before the movie but the movie crew built all the rest of the buildings. She says the movie is still popular enough to bring people in and it’s the 20 year anniversary this summer so they are having a bee festival. The front case in the café had props from the movie and as I sat there eating my friend green tomatoes, trains went by showing how the café got it’s name. I did not eat the barbq, in case anyone is worried. Perfect timing, perfect little café with a gorgeous wood U-shaped bar right in the middle. If you watch the movie, you’ll see the café in most of the interior shots of the restaurant. 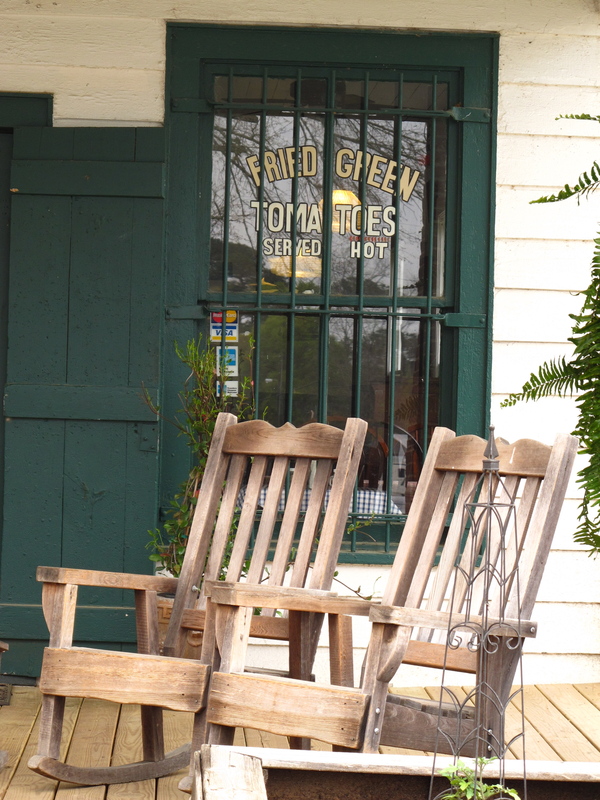 I’d say the fried green tomatoes were only ok (sad…) but the peach cobbler was astonishing. If you haven’t watched the movie, I’d recommend it. Mary Louise Parker pre-Weeds and Jessica Tandy in one of her final roles. Whatever happened to Mary Stuart Masterson? She just dropped off the earth. So, full up of random country sweetness, I drove into Atlanta in time for class at Be Hot Yoga. Every studio I’ve visited up to now has had Bikram on their signage and this one does not. I’m sure there are a lot of politics involved in the business of Bikrams studios and I didn’t ask for details but I know there are distinctions between officially sanctioned Bikram studios and hot yoga studios so I was curious if there would be differences in the classes. Mostly I felt like it was a less formal class than the ones I’ve taken before. The poses and breathing exercises were the same, the teacher “patter” had some of the same verbiage in it but the teaching style leaned heavily towards encouragement on not doing the full pose if you are new or don’t think you are up for it. I think for some students – new ones especially – this allows them to ease in to a class. For me, it makes me competitive and determined to do the hardest pose possible. Apparently I have a negative reaction to a teacher telling me to take it easy. I’ll just say right now that every way I feel about this class is based on the kind of student that I am and the kind of teacher/class that I want. I know next to nothing about Bikram and very little about teaching group classes so I’m in no way saying that this studio is doing anything wrong or that it’s related to a lack of “Bikram-ness” but simply that this teacher isn’t for me and I won’t go back. I want to be pushed. I want to try even if I fall out and it looks crappy. To work beyond my flexibility and my comfort level. To try harder and fail better. I want to be corrected when I’m doing it wrong but told to go deeper and further. I come to Bikram – and most other physical pursuits – with a need to better myself and I know that if I stay within the boundaries of my comfort level I will never reach that place. BUT, not every student needs this from Bikram and not every teacher wants to teach students like me. Thus my Bikram lesson of the day: Know thyself. Know when I’m cheating a pose and know when my body doesn’t want to go there and pushing will only injure me. This is an important distinction for me and I don’t have it yet. I got a lot of very beneficial corrections on my poses from Kathy today so the class was great for me even though it wasn’t great for me. You know what I mean. My final note, for you American Idol fans is that Kellie Pickler will be performing at the Vidalia Sweet Onion Music Festival this summer. I kind of love everything about that lineup. Short stint in ATL including a lovely dinner with my friend Elizabeth. Nashville tomorrow. This entry was posted in Bikram, Bikram Yoga, Georgia, Good eating, Juliette GA, Road Trip 2011, Savannah, Sunnyside Up, Whistle Stop Cafe and tagged Be Hot Yoga Atlanta, Bikram ranting probably brought on by heat and dehydration, Fresh Air Fiend, Fried Green Tomatoes, I had much better fried green tomatoes at 6 Feet Under tonight, Paul Theroux, pickles and onions make me laugh, sometimes I think I could live in the middle of the country like that, Sunnyside Up, Whistle Stop Cafe, Whistle Stop Cafe made me want to see the movie again, wish I had more time in ATL with Elizabeth. Bookmark the permalink. hey I just caught up with you and your posts. Be careful and have a great time. From experience, this opportunity only happens once even if you plan on another one. Something (life) always gets in the way. L; N.
N: true story. I’m soaking it up. I hope I see you in AZ at some point this summer.